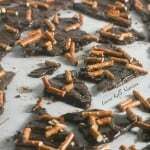 An easy chocolate candy recipe inspired by a favorite coffee shop drink with only five ingredients for Christmas, Valentine's Day, or any day that calls for chocolate. 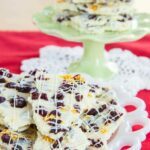 Chocolate bark recipes based on some of your favorite coffee shop drinks and treats are the perfect addition to your holidays. Seasonal Starbucks flavors are always a favorite, as is chocolate bark. That’s because it only takes a few ingredients and several minutes of work to create delicious and gorgeous Christmas candy. And they are so easy anyone can do it! 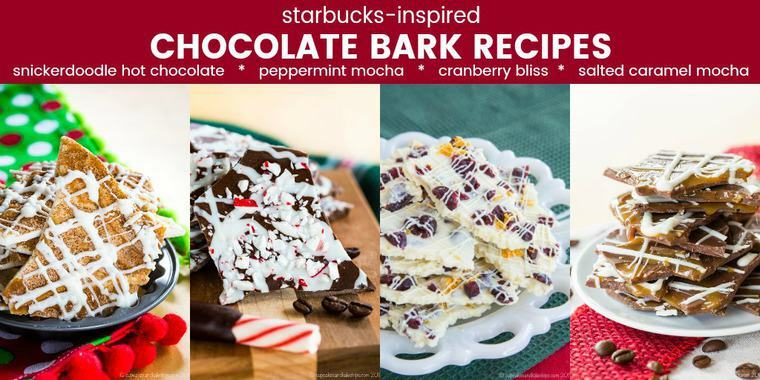 So pour yourself a cup of coffee and make these Starbucks Inspired Chocolate Bark Recipes. Chocolate bark is such a fabulous addition to our holiday treat-making plans. If you’ve spend a lot of time baking cookies, but want just one more thing to add to your assortment, or you don’t know how to bake at all, this is definitely something you can find time to make. 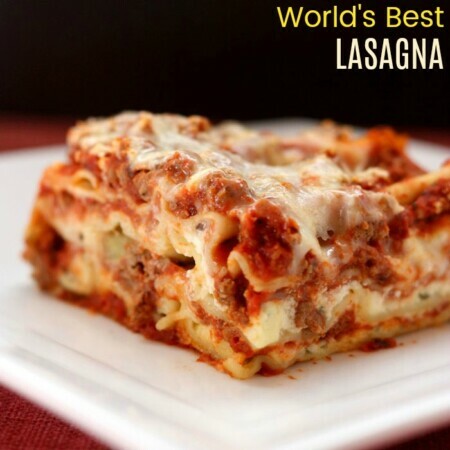 Each recipe takes only five or six ingredients, and you don’t have to have any baking skills to do it. You don’t even need a stove since you can melt the chocolate in the microwave. Or vice versa! And with a sprinkle of this and a drizzle of that, you have a gorgeous treat worthy of any cookie platter or even to give as holiday gifts! Rich chocolate infused with espresso, swirls of caramel, and a sprinkle of sea salt gives this chocolate bark everything you love about a Salted Caramel Mocha, whether you choose the hot coffee drink or the Frappuccino version. 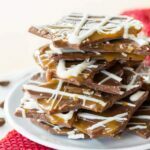 Salted Caramel Mocha Chocolate Bark is truly a treat that will have coffee lovers buzzing. I think this is my favorite of the Starbucks chocolate bark recipes. Line a large baking sheet with a silicone mat or wax paper. Melt the chocolate in the microwave or double boiler according to package instructions. If there are not melting instructions, in a double boiler (or on pot set atop another with about an inch of water), bring the water to a simmer in the bottom, and gently melt the chocolate. Or microwave for 30 seconds, stir, then microwave at 15-30 second intervals until melted and smooth. As soon as the chocolate is melted, quickly stir in the espresso powder, then pour onto the prepared sheet and spread into a thin layer with a small offset spatula. Warm the caramel slightly until pourable and drizzle over the layer of chocolate. Swirl the caramel through the chocolate with the tip of a butter knife. Sprinkle with the sea salt. Melt the white chocolate the same way in a double boiler or the microwave and transfer to a sandwich bag. Cut off the corner and drizzle over the bark. Let harden completely, putting into the refrigerator if necessary. Break into pieces and store in an airtight container. This was the first of the Starbucks inspired chocolate bark recipes I ever created. Every time I walked into Starbucks around the holidays, I always thought the tops of the Cranberry Bliss Bars looks like white chocolate bark. So I decided to make Cranberry Bliss White Chocolate Bark. In the original post I tell you why and how I figured out to use that little secret ingredient to make the bak taste like cream cheese frosting. Then it’s filled with dried cranberries and topped with orange zest and more cranberries, just like the yummy bars. Inspired by Starbucks Cranberry Bliss Bars, this chocolate candy recipe is so easy and perfect for gifts! Line a baking sheet with parchment or a silicone baking sheet. Place a heat proof bowl over a pot of simmering water and add the chocolate. Stir until almost complete melted, remove from heat, and stir in lemon zest and dried cranberries. Working quickly, pour the chocolate onto the lined baking sheet, and using a spatula, spread intoan even layer about a 1/4-inch thick. Immediately after spreading out the chocolate, sprinkle the chopped dried cranberries and orange zest over the top. Gently press the toppings into the chocolate. Place the sheet pan in the fridge until the chocolate has firmed up, about 1 hour. Melt remaining 2 oz. chocolate, transfer into a small sandwich bag, cut off the tip and drizzle over the bark. Return to the refrigerator for a few minutes to firm up. Store the bark in an airtight container in a cool, dark place or in the refrigerator for up to one month. Everyone loves peppermint bark for the holidays, and the Peppermint Mocha is always a favorite. 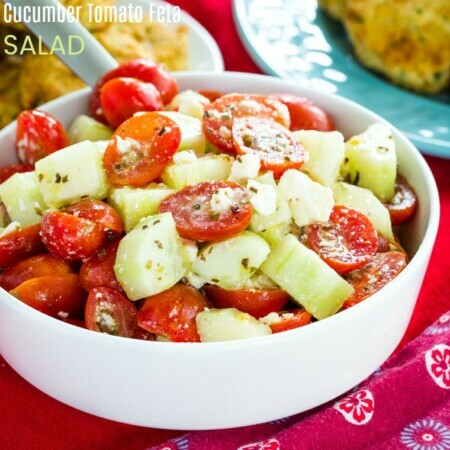 So the two are combined into one tasty and easy treat. 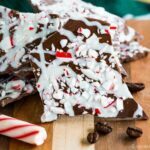 Besides checkout out the tips for making Peppermint Mocha Chocolate Bark, this post also has tips for storing and freezing your chocolate bark if you want to make chocolate bark recipes in advance. An easy five-ingredient no-bake candy recipe inspired by a favorite seasonal Starbucks holiday drink. Makes a great Christmas gift too! As soon as the chocolate is melted, quickly stir in the espresso powder and peppermint extract, then pour onto the prepared sheet and spread into a thin layer with a small offset spatula. Sprinkle with crushed peppermint candies or candy canes. The last of the Starbucks inspired chocolate bark recipes is like a cross between Starbucks Snickerdoodle Hot Chocolate and a snickerdoodle cookie. Creamy white chocolate is covered with swirls of cinnamon-y caramel and cinnamon sugar, plus an extra drizzle of white chocolate to reming you of whipped cream. 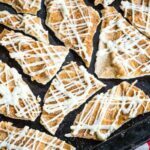 In this Snickerdoodle Hot Chocolate White Chocolate Bark recipe, you can get a few extra tips and see why these ingredients were chosen to give it its characteristic flavors. This easy candy recipe is swirled with a cinnamon caramel sauce and sprinkled with cinnamon sugar just like the Starbucks drink. Stir together 1 teaspoon cinnamon and 1 Tablespoon sugar. Set aside. Melt 12 oz. of the white chocolate in the microwave or double boiler according to package instructions. If there are not melting instructions, in a double boiler (or on pot set atop another with about an inch of water), bring the water to a simmer in the bottom, and gently melt the chocolate. 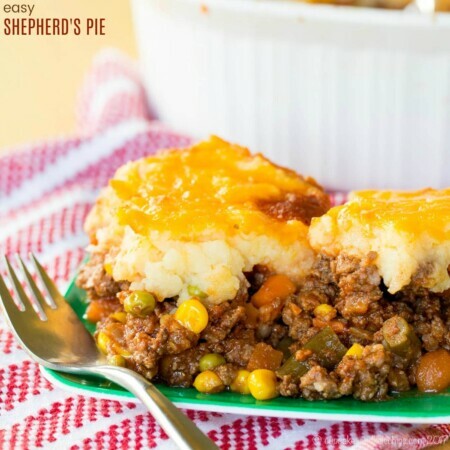 Or microwave for 30 seconds, stir, then microwave at 15-30 second intervals until melted and smooth. As soon as the chocolate is melted, quickly stir in the butter extract and vanilla extract. It will thicken a bit, but should still be spreadable. Then pour onto the prepared sheet and spread into a thin layer with a small offset spatula. Warm the caramel slightly until pourable and stir in ¼ teaspoon cinnamon. Drizzle over the layer of chocolate. Swirl the caramel through the chocolate with the tip of a butter knife. Melt the remaining 4 oz. white chocolate the same way in a double boiler or the microwave and transfer to a sandwich bag. Cut off the corner and drizzle over the bark. 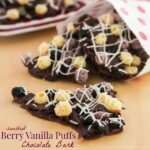 What do you need to make these chocolate bark recipes? 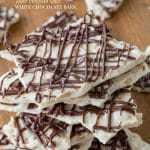 MELTING CHOCOLATE – a candy coating like CandiQuik almond bark or melting wafers makes the best chocolate bark since it melts smoothly and cools shiny and crisp. You can use chocolate chips in a pinch, but this is made for the job. 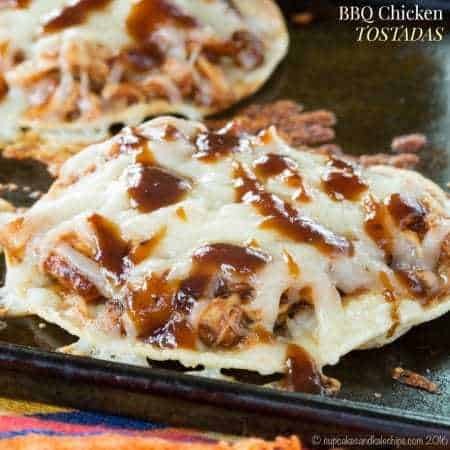 SILICONE BAKING MATS – while you can use wax paper, these days I aways use silicone baking mats. They used to be quite pricy when there was basically only one brand available. But now there are more brands and affordable options. Amazon even carries their own brand of Amazon Basics Silicone Baking Mats. At these prices, they are economical and environmentally friendly versus buying and throwing away parchment paper or wax paper. SMALL OFFSET SPATULA – using one of these little spatulas is the easiest way to spread the chocolate and swirl any ingredients. Since it is offset, you won’t be knocking into the edge of your baking sheet and you’ll get an even layer. Want more? 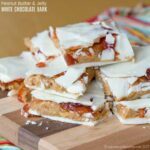 Here are 12 of the Best Easy Chocolate Bark Recipes to Make in Minutes!